1/35 German Panther Ausf.D Tank Model Discounts Apply ! DRA6428 - 1/35 German Panther Ausf.D Tank Model w/Zimmerit Coating. A new Panther is born! Dragon is proud to announce the birth of an exotic German Panther not with a coat of black fur, but rather with zimmerit coating! There was a spectacular response by modelers to the release of the Kingtiger Henschel and Kingtiger Porsche kits featuring readymade zimmerit. Requests for other tanks with such a pre-molded zimmerit coating were numerous. The result is a Panther Ausf.D that comes with full zimmerit texture on all appropriate surfaces. The coating is a masterpiece of sculpting and molding, and it equals the delicacy of a master-modeler's handiwork. This kit boasts a number of completely new parts - the turret, mantlet, upper hull, glacis, rear plate, and stowage boxes are all brand new to allow the incorporation of zimmerit. This new kit also features one-piece DS tracks with hollow guide horns, just like the original track links. 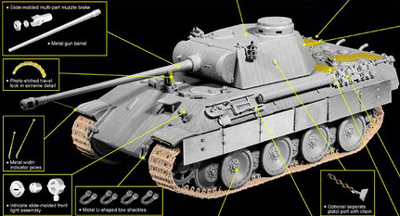 There are also a number of metal parts to help modelers accurately depict the finest of components on this famous German tank. This kit can be assembled straight from the box, with no messing around with putty and texturing tools required. For sheer convenience and accuracy, this valuable kit cannot be beaten. The Panther has been born again!